25th January 1533 – Henry VIII and Anne Boleyn marry in a secret ceremony. February 1533 – Anne talks of a craving for apples, she is pregnant. 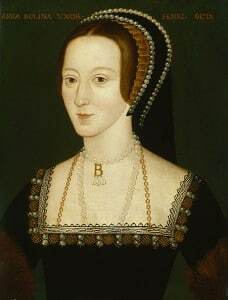 March 1533 – Henry’s court preachers proclaim the “virtues and secret merits” of Anne Boleyn while proclaiming that his marriage to Catherine is invalid. 26th March 1533 – Convocation is asked to pronounce on the validity of a papal dispensation allowing a man to marry his brother’s widow. 30th March 1533 – Thomas Cranmer is consecrated as Archbishop of Canterbury. End of March 1533 – Anne’s royal household is formed. 9th April 1533 – Catherine of Aragon is informed that she has been demoted from Queen to Dowager Princess of Wales. 11th April 1533, Good Friday – Archbishop Cranmer writes to the King asking for his permission “to determine his great cause of matrimony” and Henry VIII informs his Council that Anne is his rightful wife and Queen and that she should be accorded with royal honours. 12th April 1533 – Henry VIII replies to Cranmer, giving him “licence”, and Anne Boleyn attends Mass as Queen. 10th May 1533 – Archbishop Cranmer opens a special trial into the annulment proceedings at Dunstable Priory. 23rd May 1533 – The Dunstable trial declares that Henry VIII’s marriage to Catherine of Aragon has been annulled. 28th May 1533 – Archbishop Cranmer proclaims the validity of Henry VIII’s marriage to Anne Boleyn after a special enquiry at Lambeth Palace. 29th May 1533 – Anne Boleyn’s coronation pageantry begins. 30th May 1533 – 18 Knights of the Bath are created. 31st May 1533 – Anne Boleyn’s coronation procession. 1st June 1533 – Anne is crowned Queen after three days of pageantry, processions and celebrations. 26th August 1533 – Anne goes into confinement for the birth of her baby. 7th September 1533 – Princess Elizabeth, the future Elizabeth I, is born. 1533 – Anne Boleyn is finally queen!